A punching bag isn’t the first piece of workout equipment you would think of buying unless you are into Mixed Martial Arts (MMA), compete in boxing, or simply enjoy combat sports. But, if you devled deeper into the many benefits of boxing, a punching bag could quickly become one of your favourite workout tools. With a good free standing punching bag, you can work out your entire body (including the brain and heart) in more than one way. If you throw in some MMA moves like kicking, high knees, and jabbing, you will tone most of the major muscle groups in your upper and lower body and develop some impressive self-defence moves while you are at it. Read on to learn about the various benefits of punching bags, the different types available, as well as what it takes to ensure you make the right choice when buying one. If you are new to the world of kickboxing the Gallant 5.5ft Free Standing Boxing Punch Bag can make an excellent first time punching bag. 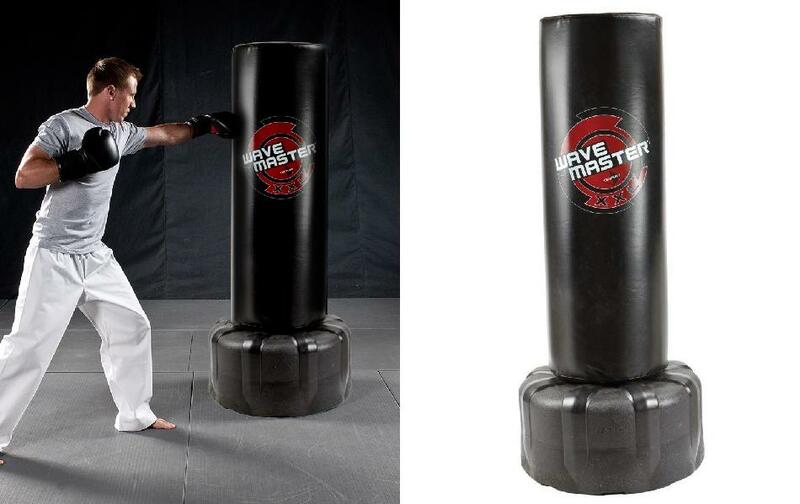 Standing over 5ft tall, this bag has a nice medium size that makes it possible for you to practice several techniques such as boxing, kicking, and mixed martial arts. Sturdy and comfortable to punch, it is perfect for beginners. Check our guide below for more information on the features to expect from this model. The build of the Gallant 5.5ft is one of its biggest strengths. The outer layer comprises of high-density PU faux leather. This material not only takes a beating without tearing but also looks great with its shiny finish. In addition, the hard-wearing leather material features 5cm thick EPE (expanded polyethylene) foam padding. This padding is strong, lightweight, and shock absorbing. An additional third layer of microfiber pieces within the bag, combined with double stitching on the outside, give it even more resilience in the face of regular pounding. Sprains, fractures, or painful joints after workouts are not something you have to worry about with this freestanding Gallant punching bag. The bag’s outer material mimics the soft feel of genuine leather. At the same time, the thick foam padding provides a nice squashy landing for your blows. However, wearing quality gloves is necessary to avoid tearing the skin on your knuckles. The base of the bag also offers a couple of advantages for the user. Designed in a shape that is more narrow than usual, the base makes it very easy to push the bag into storage. This narrow base design also offers more space for your feet to move around. 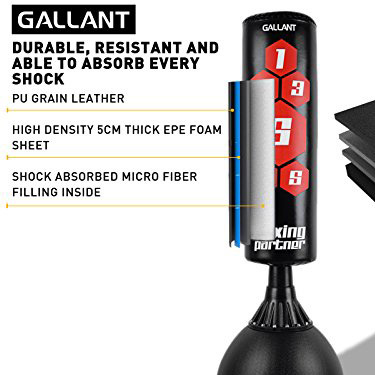 Thanks to a flexible design, the Gallant 5.5ft lends itself to an array of workout purposes. Since it is a free standing bag, you can work on a combination of punches and kicks to improve your kickboxing technique. The narrow base creates room to work on your footwork as well. If you punch with a bit of power, the bag will swing back and forth. This will give you an opportunity to work on your speed and hand-eye coordination. Another plus is that you can fill this freestanding punching bag’s base with water or sand. So, you can go with water for a good session of cardio and switch to sand when you are in the mood for a tougher workout. For such an affordable price (under £100 as of writing), the Gallant 5.5ft does a great job. It is strong enough to withstand a high level of punishment, highly functional, and safe to use thanks to a firm but soft punching surface. Overall, this is a great buy for someone who is just picking up boxing as an exercise. Whether you practice mixed martial arts and boxing as a professional athlete, to stay fit, or for self-defense training, investing in a quality punching bag will go a long way in helping you to achieve your goals. A simple way of making sure you have top-notch gear is to buy the kind of punch bags that gyms and boxing clubs use. The Maxstrength Pedestal punch bag is one such option. It comes at a low price tag compared to other professional grade punch bags. However, there is more to this fitness product other than an affordable price tag. Once filled with water or sand the base weighs up to 180Kg meaning it will stay firmly in place when you land your most powerful blows. 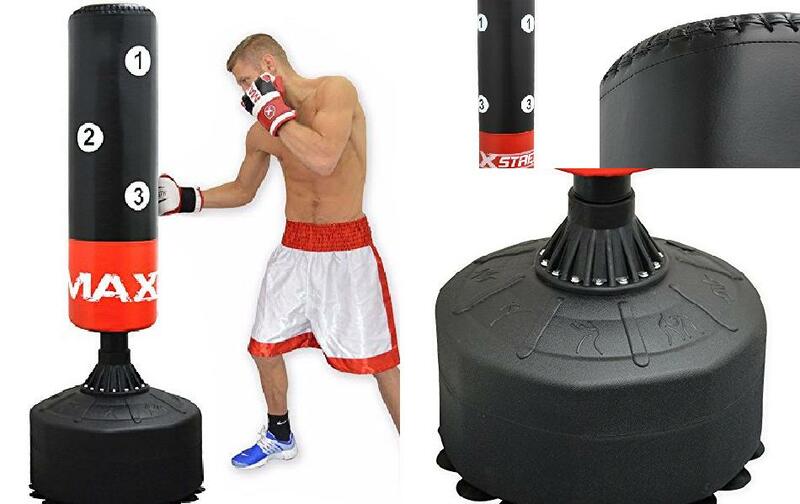 Ease of use is one of the top qualities of this pedestal punch bag from Maxstrength. The package arrives in just two parts. This includes the base with bolted neck and the machine-filled punch bag. Assembly simply involves attaching the bag to the base. Once that is done, you can weigh down the punching bag by filling the base with water or sand. What’s more, the entire punch bag with the base included stands at about 6-feet. 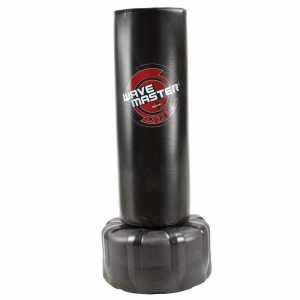 Unlike other pedestal punching bags, this Maxstrength model features a tall cylindrical shape with a low -neck profile. As a result, you will be able to punch and kick low or high without having to make height adjustments. Stability is a big concern when it comes to free standing punch bags. A flimsy design will topple over when kicked or punched too hard. 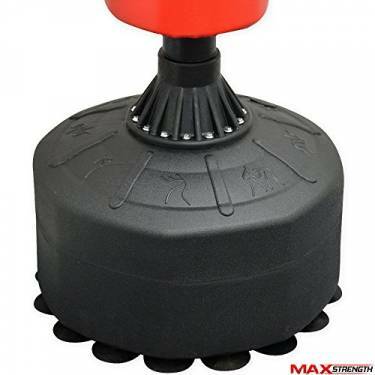 Fortunately, the Maxstrength pedestal punch bag offers great stability. It features a high-density polyethylene base with non-skid feet that provide excellent traction on all floor types. And, when filled with water or sand, this punch bag weighs up to 180Kg, making it extremely stable. The Maxstrength Pedestal punch bag features a shock absorbing design that offers several benefits to the user. To begin with, the bag’s outer cover has a 5cm thick padding of EPE foam. This soft foam reduces the impact on your hands, wrists, knuckles and shins when training. In addition, the neck is made of rubber. This helps the punching bag to better absorb force and not fall over or move around too much. 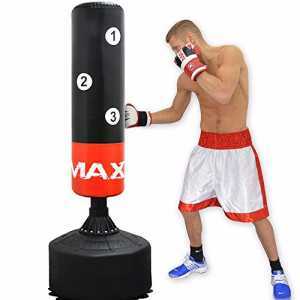 Overall, the Maxstrength Pedestal Punch bag offers good value for money. It is a heavy-duty freestanding punching bag with good foam padding, quality finishing, and great stability. The narrow base profile offers plenty of room for movement. So, if you are into kickboxing or simply want to improve your sparring technique, this punch bag is certainly worth considering. If a sparring partner is what you are looking for in your freestanding punching bag, the Century BOB is a good way to go. 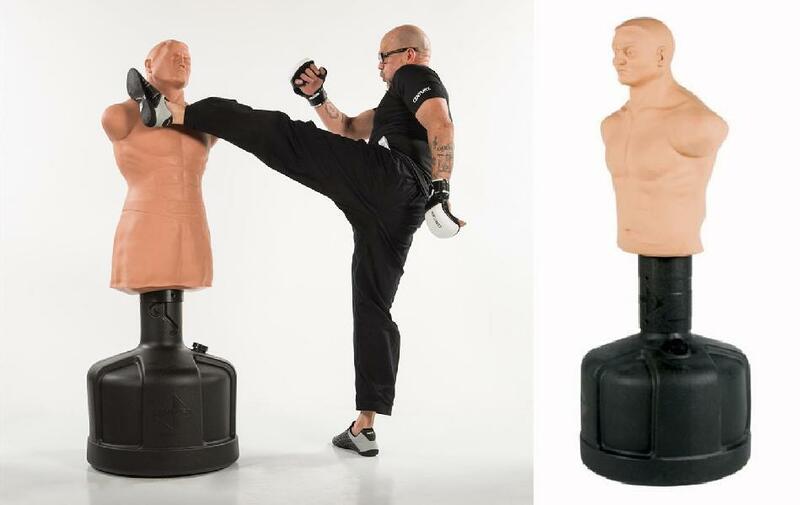 This punch bag may not fight back, but its lifelike shape provides the perfect surface for improving punch accuracy and technique. Soon you will be an unstoppable fighting machine who knows just where and how hard to hit and inflict the most harm when in a real fight. Read our in-depth guide on the Century BOB Freestanding Punch Bag to find out what it offers and if it will be a good fit for your training needs. Century BOB simulates striking a person and is ideal for martial arts training. The Century BOB Freestanding Punch Bag is designed for the sole purpose of helping you practice strikes against a live person. Like other freestanding bags of its kind, the Century Body Opponent Bag is a representation of a masculine human torso with a head. This allows you to practice everything from landing punches on the rib area and torso kicks to elbows aimed at the chin and knees directed toward the gut. 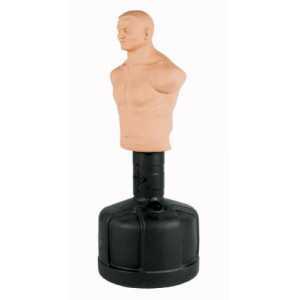 You can even practice headshots with this BOB punch bag. And, you do not have to look far for motivation to workout. The punch bag has a mean looking facial expression, which just makes you want to give good ol’ BOB one heck of a beating! To complete a realistic experience of fighting a real opponent, the Century BOB bag is made of a high-strength plastisol material that simulates the feel of striking a person. The material, in turn, is stuffed with high-density urethane foam padding on the inside. This results in arguably one of the best punching surfaces around as the plastisol exterior is soft while the foam underneath has great absorbing powers. Some users actually claim that the material is so soft that you can get away with punching at Century BOB barehanded. However, it is wiser to wear gloves or hand wraps at the very least to avoid ending up with busted knuckles. Short or tall, you will be able to work out on the Century BOB. The punch bag adjusts over 7 different positions over a range of 60” to 78”. This adjustable height is also great for practicing how to fight against opponents of varied heights plus learning how to strike a specific target at various levels or from different angles. Much as you may want to wipe off the mean look on Century BOB’s face with an explosive punch, you really should not. Powerful strikes can knock pieces like the nose or even the entire head right off the mannequin. This is because the punching bag is built for accuracy and technique training rather than power striking. For this reason, Century BOB makes a good punching bag for martial artists or anyone looking to develop self-defense skills. So if you are looking to improve the power behind your punches, you should look elsewhere. The Century Wavemaster XXL, for instance, does an excellent job on that front. As far as free standing punching bags go, the Century Wavemaster XXL Training Bag is one of the most popular models around. Some even argue that it is quite possibly the best free standing model you will come across on the market. With features like a broad striking surface, high density foam padding on the interior, highly stable base, and one of the heaviest weights when filled, that could very well be true. Take a look at our Century Wavemaster XXL guide to learn more about the notable features of this free standing punching bag. With most freestanding bag options coming in the combo of either short and bulky or tall and slim, the Wavemaster XXL stands as a towering monster. 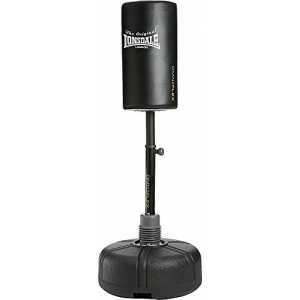 Measuring 69inches in height and 18inches in diameter, it offers the best of both worlds, a punching bag that is both tall and bulky. Add this to the fact that you can move at 360° around the bag and you have a great workout tool that offers plenty of striking space to practice all manner of punches and kicks. In addition to the large kicking and punching surface, the Wavemaster XXL adds immense stability and weight to the mix. So, don’t hold back during your workouts. The base is designed with a low profile that distributes its weight evenly over the structure. This makes for excellent stability that allows you to hit hard without risk of the punching bag toppling over. Once the base is filled, the bag’s weight rises to roughly 270lbs, giving you a great deal of resistance to work against. Durability is another attractive feature of the Century Wavemaster XXL punching bag. This model comes with a durable vinyl cover on the outside along with multiple layers of foam on the inside. Both materials are tough and capable of holding up well against repeated strikes. The high density foam is particularly highly forgiving. It absorbs impact from blows quite well. This, in turn, prevents the bag from bearing the brunt as well as rocking or moving too much. Featuring a hard plastic material, the base is also designed with durability in mind. Durable, stable, easy to punch, and with enough power to serve both amateurs and serious martial artists, there are no complaints about the Century Wavemaster XXL Training bag. As such, the bag will make a good buy if you are looking for a top quality freestanding punch bag and do not mind spending the over £300 in a workout tool that will help you stay fit and improve your martial arts skills. Lonsdale is a popular brand that offers a wide selection of punching bags. 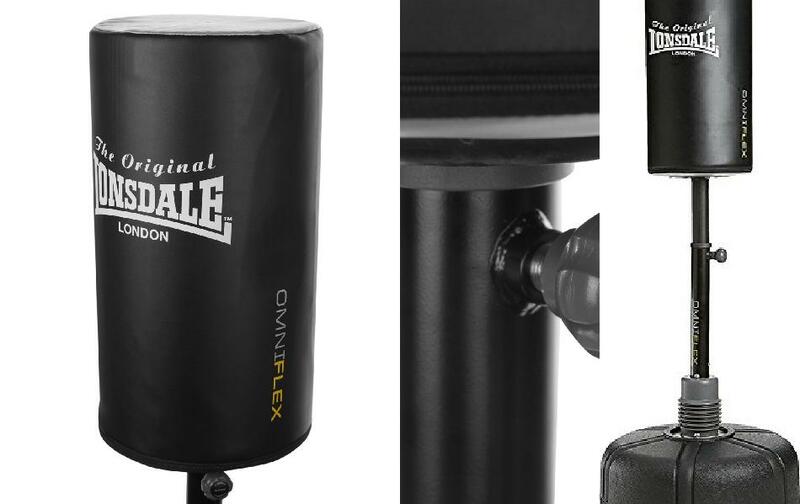 Among the many options that they have to offer, the Lonsdale Omni Flex Free Standing punch bag is a good choice if you want to improve your boxing, kicking and self-defense techniques. One of the best aspects about the Omni Flex punching bag from Lonsdale is the fact that its height is adjustable. You can adjust the hitting area from 150cm to a maximum height of 170cm. As a result, anyone between 5’ and 5’7” will be able to use this punching bag comfortably. Adjusting the height is also very easy. All you have to do is loosen the adjustment knob, raise or lower the neck shaft then tighten to lock your height preference in place. 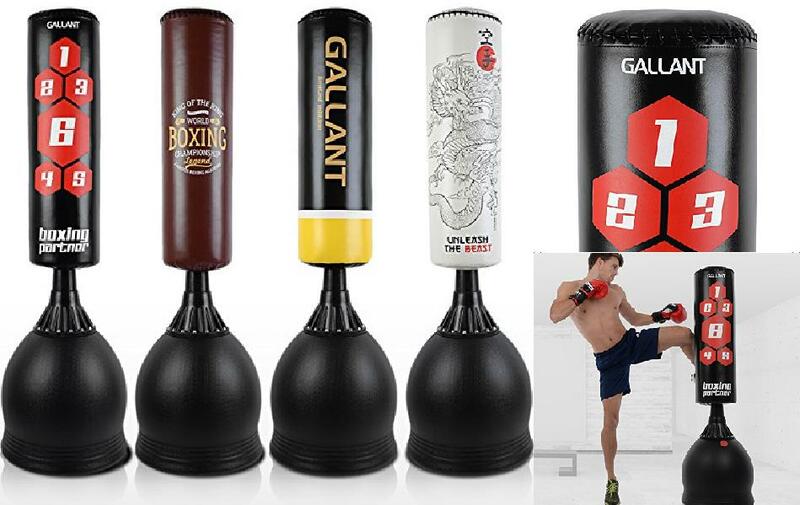 The design of this punching bag provides plenty of possibilities to practice your kicking and boxing skills. For instance, the flexible neck joint sways back and forth when punched, allowing you to duck. Such movements offer good practice on how to evade opponent strikes. The hitting area is also short, so you can place light uppercuts or high knees under the bag’s base. You can practice your low and high-kick moves as well by simply adjusting the bag’s height. The Lonsdale Omni Flex free standing punch bag may have a lightweight plastic base, but you can use sand or water to weigh it down. The hole in the base is rather small. So, filling the base with water is much easier than trying to add sand. Mixing sand and water will make the base very heavy and keep the freestanding punching bag extremely stable. With a weight of 100kg, the Lonsdale Omni Flex offers good resistance for a punching bag. But, with such a flexible neck, it is best suited for technique improvement. Other than practicing your punching and kicking, this bag’s fast rebound will help you to hone your head movements as well as single and double-handed covers. 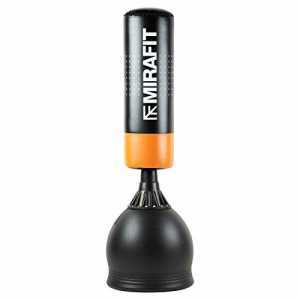 You will never guess by just looking at it, but the Mirafit Punch Bag & Base has a lot to offer. To start with, this punching bag is cheap (retailing at under £80 at the time of writing). It also looks great in its cute black & orange colours, sleek finish, and narrow base. The bag packs a punch as well. It is tough, stable, long lasting, and has a nice full length. With this design, you can use it for everything from combination punches to kicks and knee strikes. 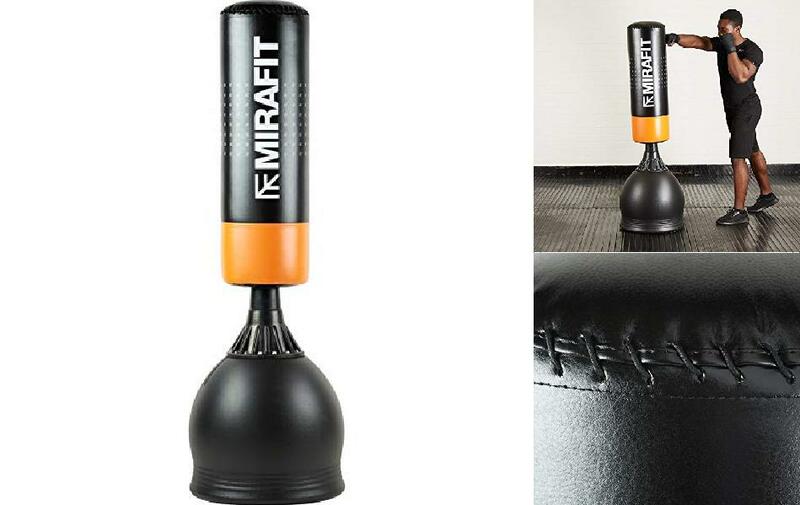 Despite its very affordable price, the Mirafit Punch Bag does not disappoint when it comes to quality. Its outer cover is made of PU faux leather. Although not actual animal hide, this synthetic leather is durable. More importantly, it will take a lot of blows before tearing thanks to decent stitching that holds everything together. Power punches and kicks on the bag’s surface will not be a problem. This is because the Mirafit bag offers way more resistance than other freestanding punch bags in its price range. 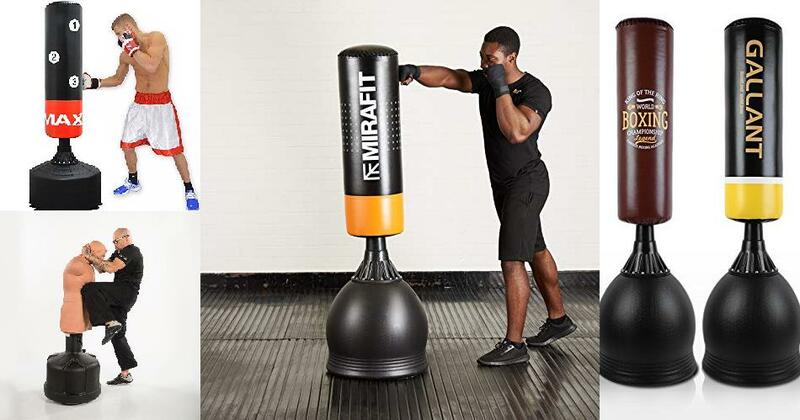 When the base is filled up, this Mirafit punch bag weighs approximately 80kgs – just slightly over 40kilos less than the Wavemaster XXL, which is considered a powerful punch bag. Things are made even better with the punch bag’s high-rebound foam interior (filled with cloth pieces), which delivers an expert level of resistance during punching and kicking. One common problem among freestanding bags is that they tend to slide across the floor when punched. This forces the user to place a rug under the bag or weights on the sides to keep the base in one place. With the Mirafit Punch Bag, none of that is necessary. You can engage in continuous blows on the bag since it has an anti-slip base that helps to enhance stability. The punch bag also features a strong base mount that adds even more stability, allowing for a nice solid workout where the bag does not move too much. Much like its equally affordable counterpart the Gallant 5.5ft freestanding bag, this Mirafit Punch Bag is great for boxing newbies. The punch bag is well made, stable, and offers a good amount of resistance. It even has a narrow base similar to that of the Gallant’s, which makes for easy transportation and allows for close range shots. Overall, it provides great value and is very soft on your finances. While a punching bag will have you swinging your arms and legs, the part of your body that does the most work is your heart. Usually, any workouts that get your blood flowing and up your oxygenintake (e.g. running) are great for improving your cardiovascular health. Boxing not only offers both of these benefits but also takes things a notch higher than your usual cardio workouts. With boxing, you will be constantly moving around and shifting position in order to land accurate blows. This puts stress on your heart and lungs pushing both organs to work harder to meet the increased demand for blood flow and oxygen intake. In addition, every punching action uses several muscles at once. Swinging utilizes the muscles in your arms and shoulders while landing a powerful punch requires that you put your entire weight behind the motion. This sees your arms, shoulders, core, back, hips, and legs all work together in unison to accomplish that. Even the simple act of shifting your stance to land another punch engages several muscles along your core and legs. Overall, every move you make causes several muscles to contract at once. This ends up giving your heart a run for its money since it has to work even harder to pump blood and oxygen to the muscles. Boxing is a power sport. In fact, pro boxers train regularly with a punching bag to increase the power behind their punches. So, if you keep at it long enough, you will end up improving on total body strength. Even your knuckles, wrists, ankles, and other joints will grow stronger with regular boxing. Boxing has also been shown to make bones stronger and denser. Boxing is one of the best fattrimming activities around for two reasons. Firstly, you are repeatedly working several muscles at the same time. Therefore, in addition to getting stronger, you will also increase muscle mass. The bigger your muscles get, the more energy you will need to perform everyday tasks. This means you will be burning more unwanted fat and calories than you normally do as you go about your life even with something as simple as going up a flight of stairs. Secondly, boxing is a tough physical activity. A typical workout session will take you through a combination of moves. These may include large swings (uppercuts, crosses, hooks), smaller punches (jabs), short quick steps (back & forth motion), as well as the occasional squatting and ducking. Moreover, this is done between transitional periods of intense explosive bouts followed by moderately intense recovery times. The result is that you will be burning a lot of calories (approximately 400 to 700 burnt calories every hour depending on an array of factors). 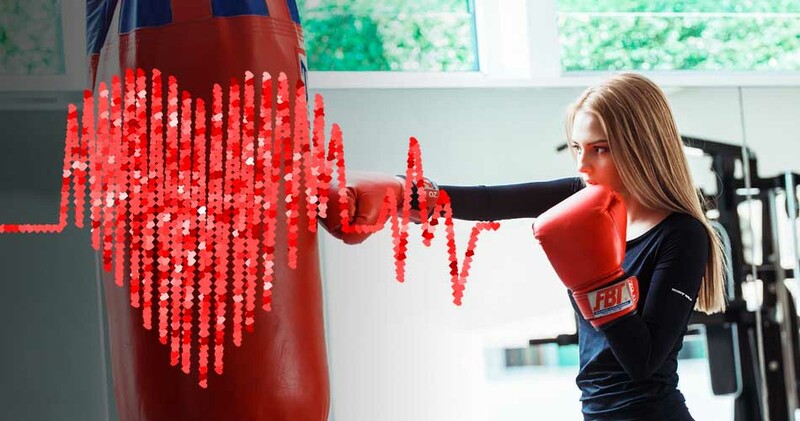 This kind of strenuous exercise will also shoot up your metabolism and keep your EPOC (Excess Post-exercise Oxygen Consumption) levels at an all-time high allowing you to keep burning calories and fat even after you put down your boxing gloves. When you are tasked with punching and possibly kicking a bag, your eyes, hands, and legs will have to work together to accomplish the task. This improves hand-eye coordination and builds up your agility. What’s more, since your core, back and leg muscles are all engaged in the action, you will also improve on your balance. Boxing is not just a physically taxing activity. It also helps to balance your mind. Just like any substantial form of physical activity, boxing will release feel-good endorphins that will improve your mood and consequently help to reduce stress. Weight is the very first thing you should look into when choosing a heavy punching bag. The weight of a bag determines its level of resistance, which in turn dictates how hard you will have to work. The heavier a bag, the more resistance it will provide and the more difficult your workout will be. A heavy punching bag also offers the added benefit of stability. Unlike a light bag, which will go flying with every blow or kick you land, heavy punching bags remain in place, making it easy for you to build up a consistent flow that will make for a more strenuous workout. But just because heavy is good does not mean you should just go out and buy the heaviest punching bag you find. There is also the issue of safety. If a bag is too heavy, punching and kicking will hurt. This might even result in injuries like sprains, fractures, or breaks along your joints. The swinging of a light bag is also not entirely bad. It ensures you do not remain stationary while punching and provides a real combat-like situation where you can sidestep, block, or strike the bag as it comes towards you just as if you were fighting an actual opponent. So, what is the right weight for a punching bag? If you are new to boxing, the general rule is to go for a bag that is half your weight. It will provide a good enough resistance for an effective workout or training session without putting your hands and legs at risk of suffering injury. So if you weigh 160 pounds, a 70 to 80-pound punching bag will be an ideal fit. Of course, you can go higher or below the 1/2 your body weight mark depending on your level of fitness. This rule only works for hanging bags since the freestanding versions are a little different. Unlike the conventional heavy bag, which swings when hit, free standing punching bags bend back when struck and then rebound to the original position. For this reason, every bag has a specific amount of maximum force it can take before toppling over. So, heavier is definitely better with a freestanding bag. With a heavy bag, you can continue working out even as you grow stronger without the risk of knocking it over. Another important aspect of punching bags to look into when buying one is the type of interior padding that is present. The available filling material will have a huge say in how it will feel to punch the bag. Here is a quick look at the various available to help you make the right pick. Sand: This is usually the go-to choice for heavy hitters. In addition to being heavy, sand bags do not offer too much cushioning. So when hit, a punching bag filled with sand will put up a fight. This makes it great for strength training. The problem with sand is that it sinks to the bottom after a while making that area very hard to hit and potentially harmful to the user. Fabric: Consisting of shredded fibre or compressed pieces of fabric, these bags offer a similar punching feel to sand. Fabric bags, however, do not have the risk of the material sinking to the bottom. As a result, resistance remains the same throughout the bag. Foam: Much softer than fabric and sand, foam-punching bags absorb punches better and as such deliver a more natural feel during boxing. Water: Better known as aqua bags, water-filled punching bags are in a category of their own. They feature a thick plastic synthetic material with a rubbery feel to it on the outside and water on the inside. The idea behind aqua bags is to provide a feel that is similar to punching a human body. When hitting a water-filled punching bag, your blows sink in a little – much like striking human flesh. This is great for your joints as you can hit as hard as you can without risking injury. Another plus for aqua bags is that they hold up their shape well and you will, therefore, enjoy the same softer feel everywhere you punch or kick. Leather: Easy on the hands, tough, and extremely durable, leather is the best material for punching bags. It is just too bad that bags made from genuine leather fetch the highest prices. So, if you choose leather, be prepared to pay a high price. A slightly cheaper alternative is synthetic leather. Although it is not as smooth as the real deal, synthetic leather still performs well. Canvas: This is a heavy cotton material that also offers the benefit of durability. Canvas can easily handle pounding from regular intense workouts. Vinyl: This is the cheapest option around. Unfortunately, the lower price means that vinyl bags usually do not last as long as canvas and leather ones although they are still durable. Plastic: Thick and rubbery, a plastic cover is usually found on specialized punching bags especially those that hold water. The material is both comfortable and durable. Why Choose Free Standing Punching Bags? When buying a punching bag for home use, it is more sensible to go with the freestanding model. Highly convenient, this type of punching bag can be used anywhere in your home since it does not need to be secured to the ceiling or wall. It is also great if you are short on space, as you can simply roll your freestanding punching bag into storage after use. Another plus for free standing punching bags is that they allow for a combination of boxing and kicking moves including low kicks. This makes them a great fit for the exerciser looking to get a quick and tough workout out of their punching bag. This type of heavy punching bag is also the best option for beginners. Freestanding bags have more give (i.e. are lighter) than their hanging counterparts. As a result, they are easy on your hands and legs. Once you have decided on the type of punching bag and settled on the weight, filling, and outer covering you want, the rest is easy. Now you just need to compare bags and choose the one that best matches your needs. Here are a few more tips to ensure you end up with the best punching bag. It will be much cheaper to buy all your boxing gear in one package than to shop separately. So look hard at what a punching bag offers. Punching gloves and hand wraps are some of the accessories you can expect to find with punching bags. Some even throw in a jump rope as part of the package. The more the accessories you get with your purchase, the better. 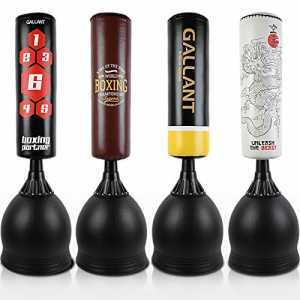 Some free standing punching bags come with a flexible design that allows you to adjust either the height or weight (or both) of the bag to your liking. These make a great buy as they can adjust your growing strength and fitness. Punching bags come in varying qualities. Some will last you a lifetime while others will start tearing, ripping at the seams, or shifting filling material even before you start reaping the benefits of punching. To avoid ending up with the latter, stick to well-known brands. Century, Everlast, and Lonsdale are a few brands that make excellent punching bags. As you would expect, punching bags come in an extensive range of prices. The type of bag you choose to buy is what will determine how much you pay. Small types like the speed, double-ended balls, and uppercut bags are obviously the cheapest options with price tags starting at less than £100. Heavy bags, on the other hand, come with much higher prices with the freestanding option being the most expensive. You can expect to pay £150 to upwards of more than £200 for a decent hanging bag and anywhere from £100 to over £350 for a freestanding model. A punching bag is a great and fun tool that can fit into anyone’s workout plan. Boxers can use it train while the rest of us can punch and kick our way to a slimmer body, stronger sculpted muscles, healthier heart and better endurance & coordination. And, the best part is, boxing does have to feel like work – its fun and offers a variety of different ways for you to train. Therefore, you will get to enjoy all of the benefits mentioned in this guide without it feeling dull and monotonous. Is there a better reason than that to grab a punch bag and give boxing a try?